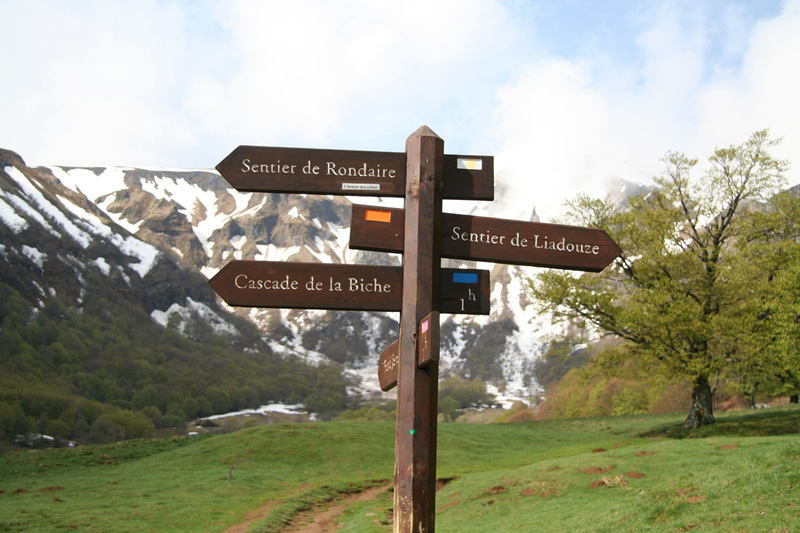 How to get there: Puy de Sancy is the highest point in an isolated mountain area called Massif Central, an old stratovolcano. The area is about 200 kilometer west of Lyon, the closest larger city is Clermont-Ferrand. From Clermont-Ferrand, one should locate Hwy. N89 connecting (left turn) with Hwy. D983. Hwy. D983 ends at Hwy. D996 quite close to the town Mont Dore. This is a town serving tourists (in winter skiers) to the area. Almost the entire mountain has been covered by ski lifts and one can certainly hike this mountain via a lift or from the ski area. Thus, a minimum net elevation gain of 600 meter may not be met on the easiest route. Instead of accessing this mountain from the north (Mont Dore), I would strongly recommend a hike starting from the beautiful valley "La Vallée de Chaudefour". 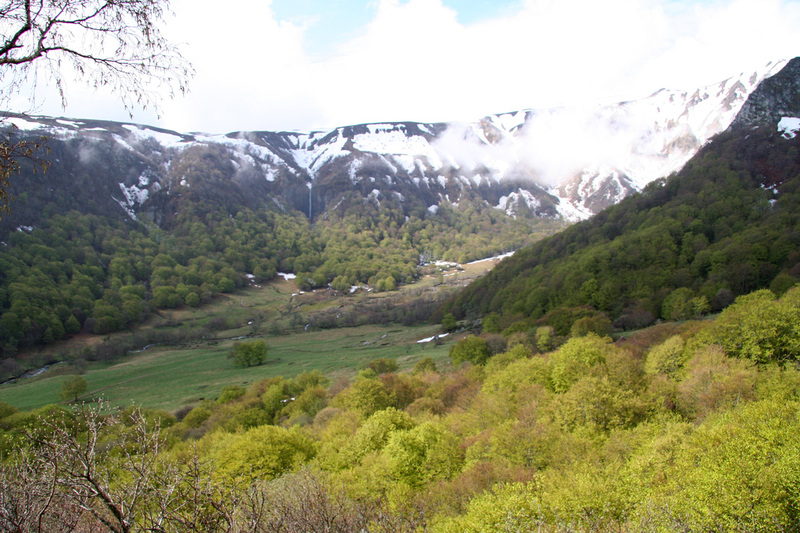 This is a protected nature reserve with no lifts and great scenery. For such a plan the small village of Murol (east of lake Lac Chambon) may serve as good base. Murol is reached by turning left from Hwy. D983 where it connects with Hwy. D996 and cross the mountains to the east. Consider staying at the "old style" Hotel de Paris in the middle of town. The room cost about Euro 32 (2006) and the restaurant served an excellent dinner in the evening. Just south of downtown Murol (uphill from Hotel de Paris), locate the road D618 going south. Drive this road 7.3 kilometer as it first climbs, then runs by local farms before hitting road D36. Make a right and continue 3.2 kilometer, keep left after 2 kilometer ignoring the road that comes in from your right side. There is a large, nice parking area on your left side. 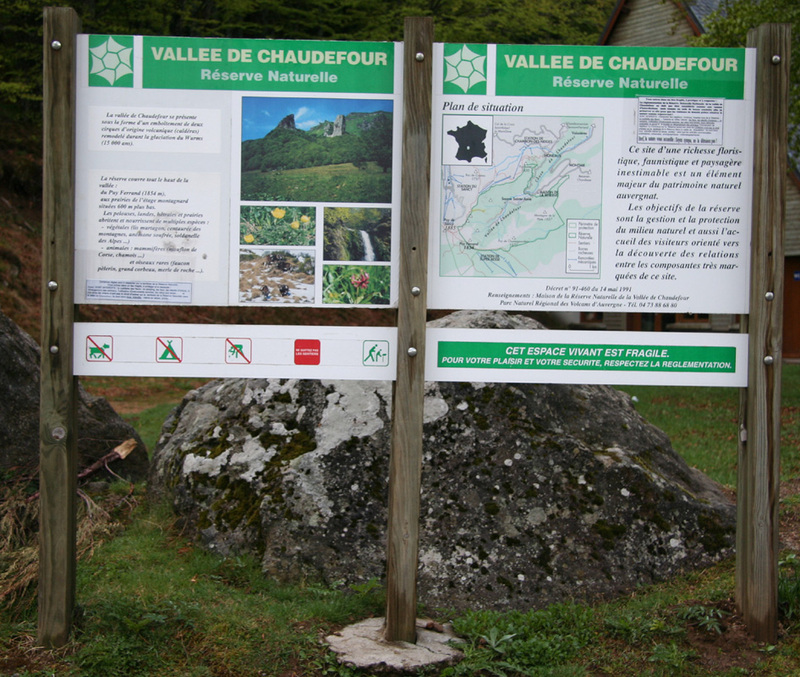 This is the trailhead and visitor center for La Vallée de Chaudefour. The elevation is 1137 meter, location N45:32.417, E002:51.688. Route description: This description is a very nice circular route from La Vallée de Chaudefour, climbing its south rim, then a ridge route west, including the high point Puy de Sancy, followed by a more high ridge walking along the north rim of the valley before descending back into the valley and returning to the trailhead. In spring, an ice axe (and possibly crampons) should be carried. 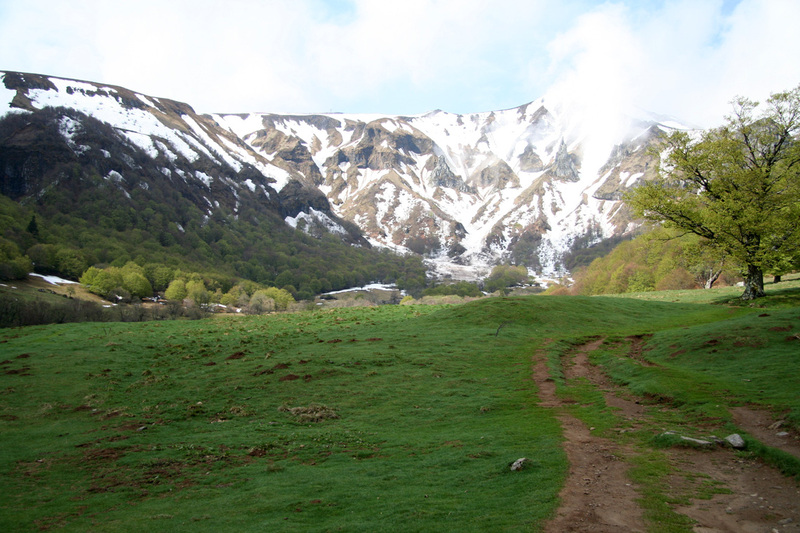 The route is quite easy and in summer the difficulty may be only (YDS) class 1 (possibly steep trail). The route can be done either way, however in the spring a clockwise route (as described) is recommended. Hike into the valley on a broad trail that runs along the left (south) side. The trail crosses the creek on a bridge then heads gently uphill into the valley basin proper. There is a big signpost with arrows pointing to various features, continue straight ahead. (If taking the counter clockwise route, then make a 90 degree right turn at this sign (Sentier de Liadouze) and carefully follow the trail that will bend further right a bit higher up.) Higher up, near a small creek, the trail forks, take the left fork as it crosses the creek. You are now at elevation 1305 m and the location is N45:31.869, E002:50.240. The trail now enters a (snow) avalanche area with broken trees everywhere. 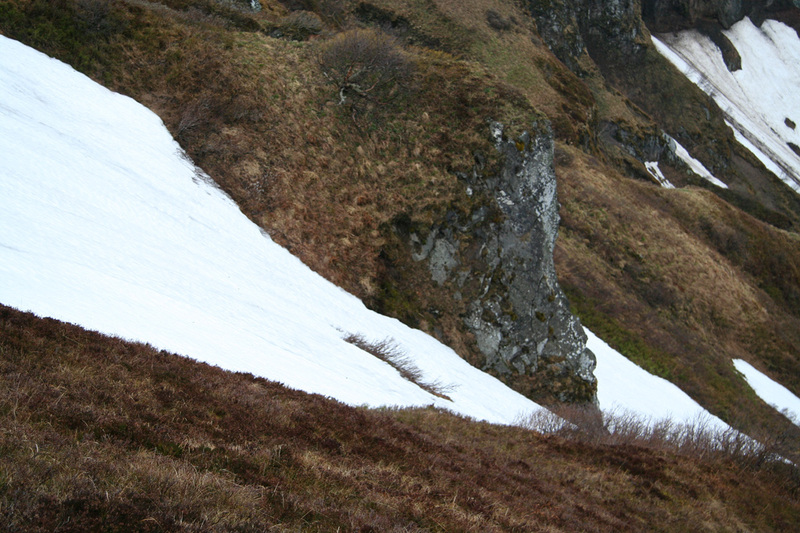 In summer, follow the trail and gain the proper ridge on the south (left) side of the valley (consult your map). In spring, locate a pretty obvious gully on the right side (west) of the summertrail that connects from the valley floor to the top of the rim. About 50 meter before this slope turns steeper uphill you are at elevation 1423m, N45:31.557, E002:50.119 while the top of the gully is at 1661m, N45:31.356, E002:50.220, a 240 meter vertical in about 340 horizontal meter. This works out as an average steepness of 35 degrees. 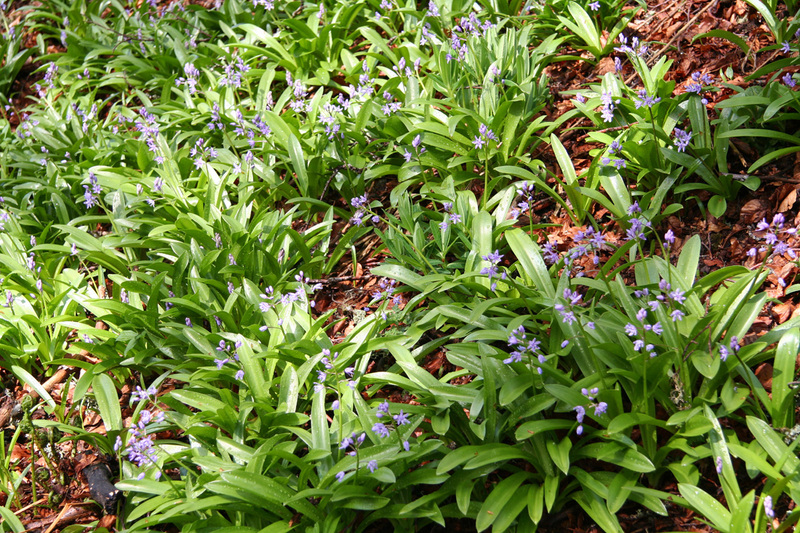 There is a more gentle section partway up, but the maximum slope stays around 45 degrees. Crampon up on nice spring snow, or if this is not an option, seek left and locate snow free terrain that can be ascended. 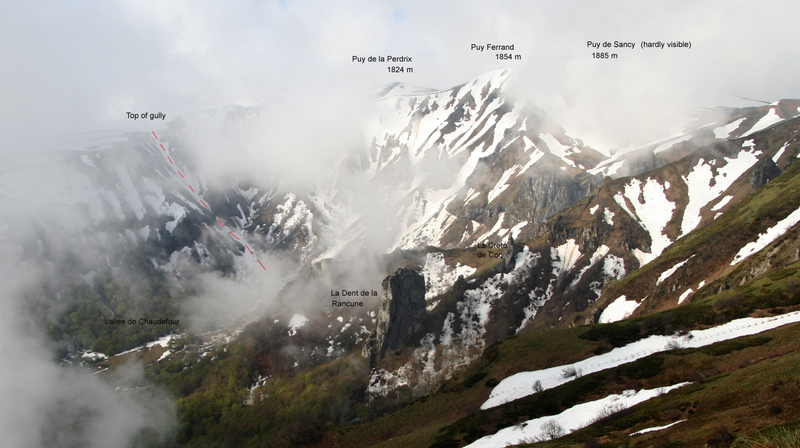 On the top, locate the trail and follow it as it climbs the ridge and crosses Puy de la Perdrix (1824m), then Puy Ferrand (1854m), point 1844, then descends to Col de la Cabane before the final ascent of Puy de Sancy. 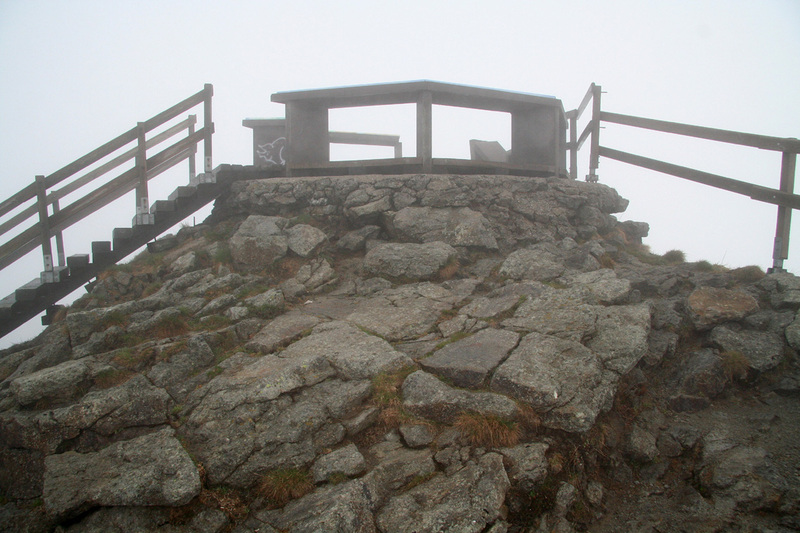 The summit has a wooden platform on its top as well as a circular viewfinder nearby. A set of wooden stairs ascends from the opposite side. Descend back the same summit ridge towards Col de la Cabane, but stay left (north) and continue descending to the lower saddle connecting with the mountains that runs north. This saddle has elevation 1719 meter, location N45:31.726, E002:49.357. 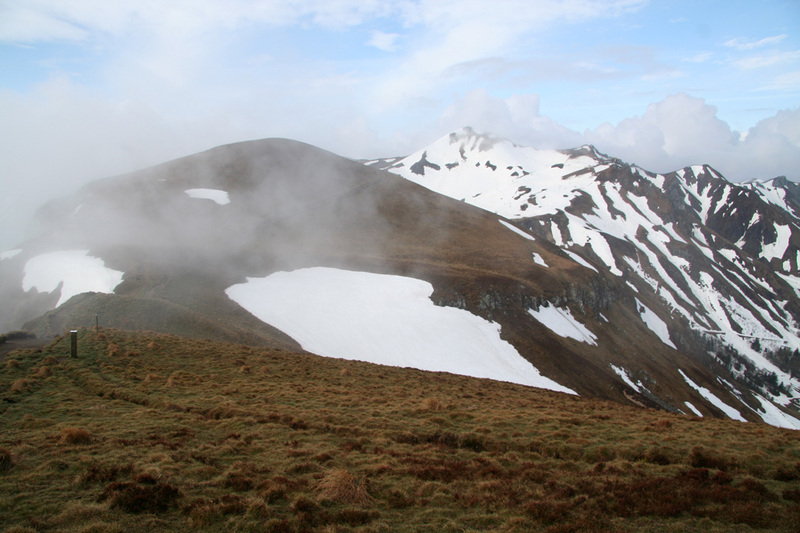 The trail now continues up on the spur 1726m, just below point 1768, then follows the ridge across Pic Intermediaire (1727m), Puy de Cacadogne (1785m), to Puy des Crebasses (1762m). 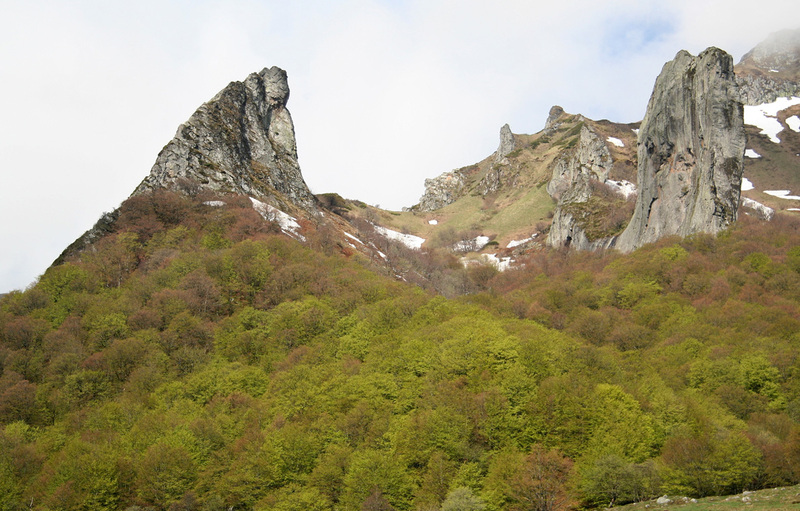 None of these peaks have primary factor exceeding 100 meter, so all can be considered subsidiary to Puy de Sancy. 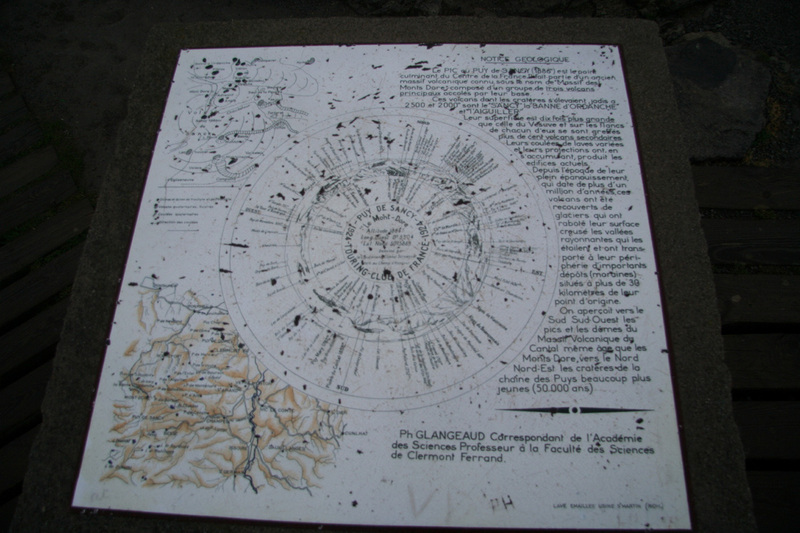 Puy des Crebasses is a nice viewpoint and there is information about La Vallée de Chaudefour placed on a lookout point near the summit. Take the right fork of the trail and continue your descent along the ridge with a continuously nice view down into the valley. Cross the small point 1615, then continue downhill. When the main trail goes left (off the ridge) at elevation 1564m, N45:32.620, E002:50.654, continue along the ridge on a much smaller trail. Follow this down into a more level area where a partly broken down fence is noticable. From here, the trail seems to disintegrate, however, by going straight downhill (south) you will run into the trail as it traverses below you. A location just a few meter above the trail is elevation 1415m, N45:32.595, E002:50.954. 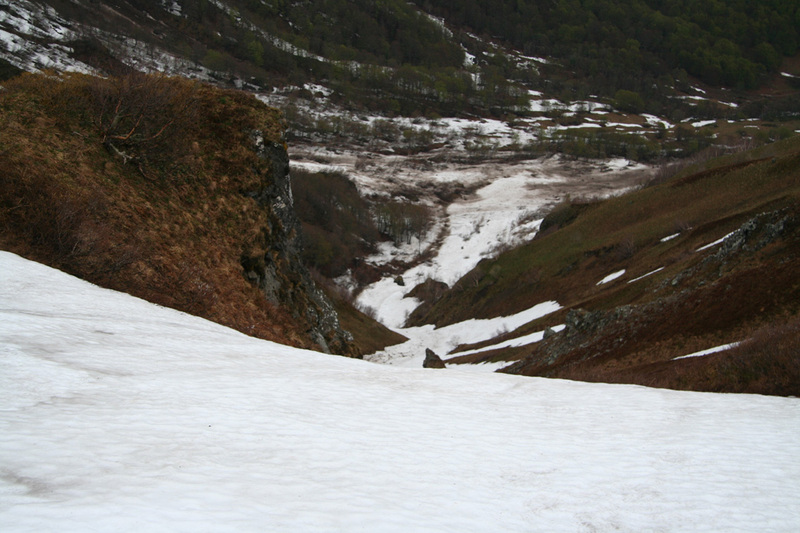 Follow this trail (right) as it traverses and gradually descends back into the valley. This trail ends directly at the big signpost described earlier. Comments/Trip report: I arrived at the trailhead at 0530, still dark and still raining. Yesterday had rain all afternoon and evening, sometimes as violent as rain can be in this area (never in Norway! ), with spectacular thunder and lightning. I started early in order to minimize the risk of thunder while in the mountains. I had breakfast in the car and when daylight came around 0600, it stopped raining and I started out up the broad trail among the trees. Despite patches of fog, clouds and mist, I quickly appreciated the beauty of the valley. Spectacular rock formations, green meadows, small creeks all ringed by a rather steep mountain slope and more snow than I had thought when comparing with the Chamechaude area from the day before. Higher up in the valley, I entered an area of "mass destruction" due to massive and huge avalanches earlier in the season. 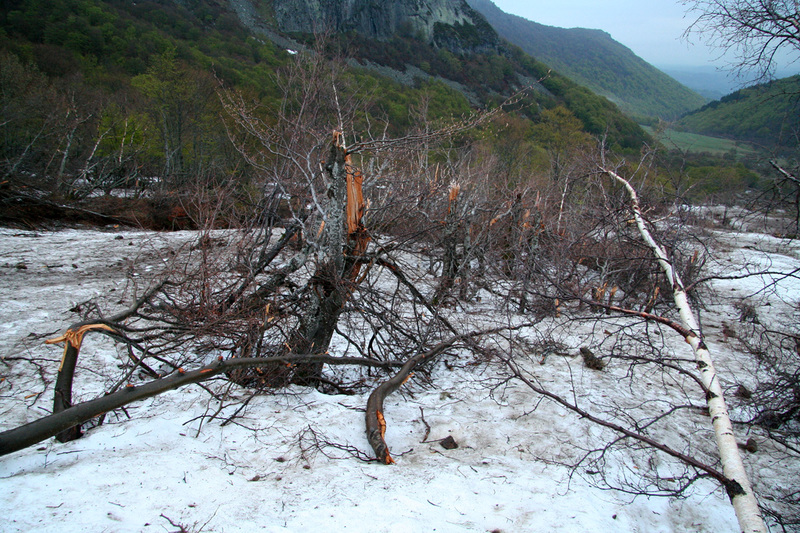 The trail vanished below the continuous snow and broken trees obstructed the way. I decided to look for a reasonable route up to the south rim, ignoring the trail altogether. A nice, snow gully that connected from the valley floor all the way to the rim caught my attention. It was difficult to judge the steepness, but since I carried crampons and an ice axe the project looked safe and feasible. The climb was fun on good snow, however, it is interesting how much steeper it looks when you stop and look back down, compared to focusing on a steady uphill pace. 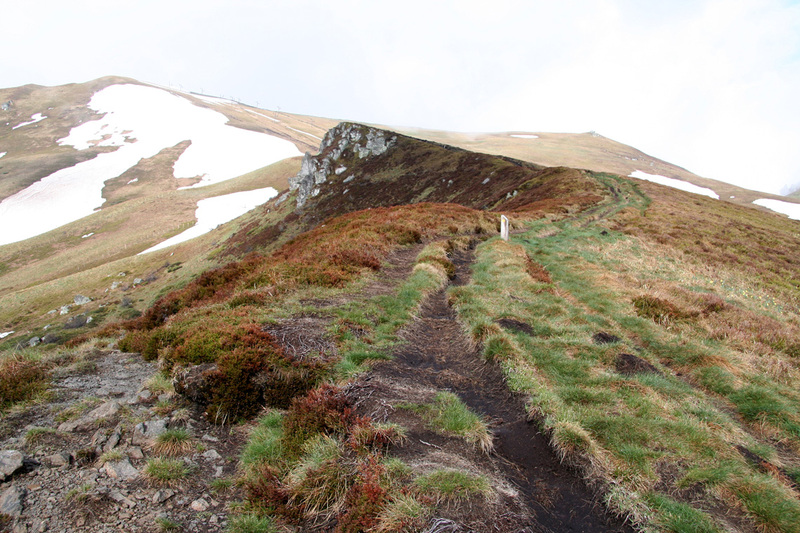 From the top of the rim, I recovered the trail and followed it towards Puy de Sancy. 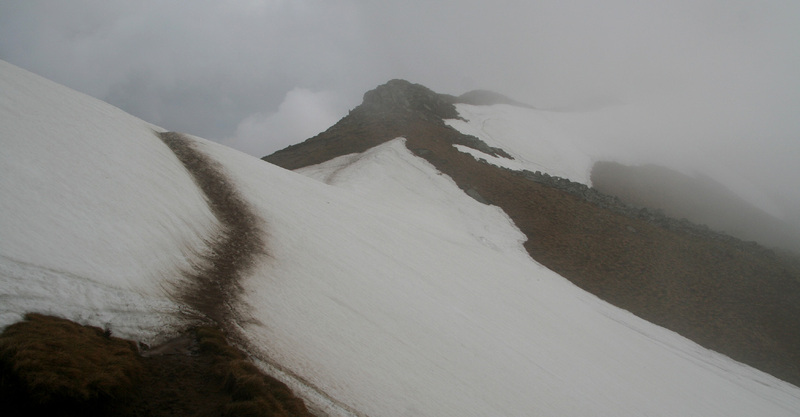 There were large snowfields and increasingly dense fog (clouds). I noticed the top of a skilift as I climbed a grassy slope to a summit. 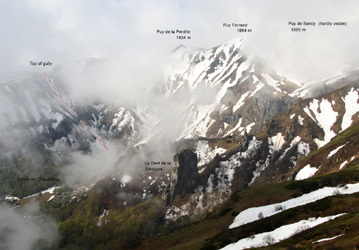 My GPS said 1856 meter, I was on Puy de Ferrand (1854m), a subsidiary peak separated by Col de la Cabane (approx. 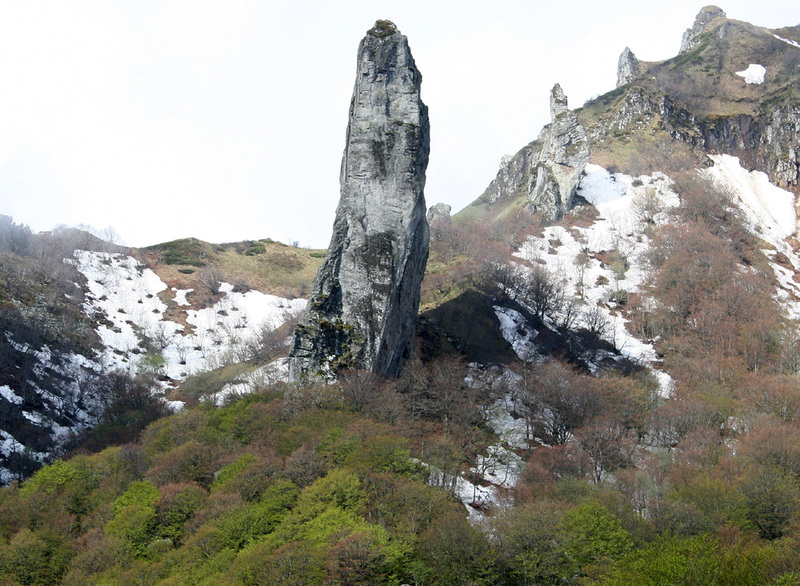 1775m) from Puy de Sancy. The final slope was all on snow and I arrived at the summit 2:15 after leaving my car. Two other men arrived simultaneously from the opposite side on what looked like a long wooden staircase. Dense fog surrounded us and called for a rather brief summit rest. 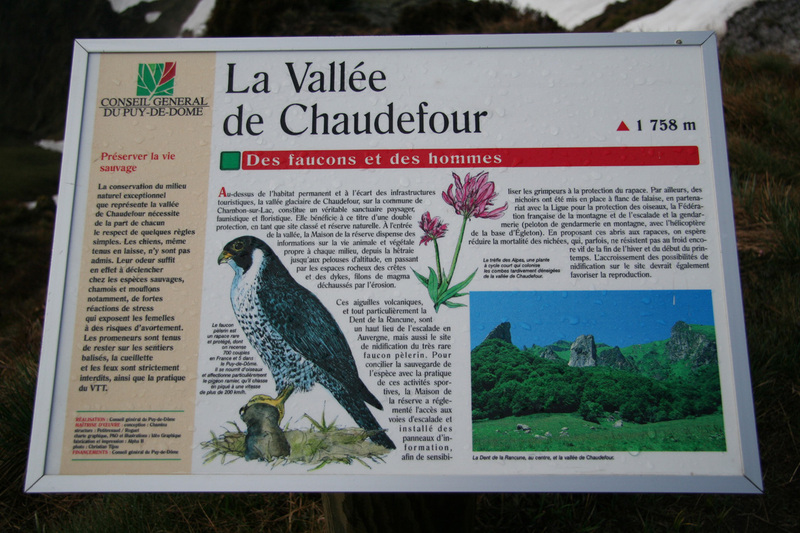 I decided to try the complete "Un Grand Tour de La Vallée de Chaudefour", realizing that my main focus would be to navigate off the peak and onto the right connecting ridge of mountains. Descending back the same initial ridge, but continuing off on the north side of Col de la Cabane, I emerged below the clouds and caught sight of another skilift. It was now pretty obvious how to locate point 1768, the first top on the ridge extending north. I soon located the trail and also observed that the weather showed clear signs of improvement. 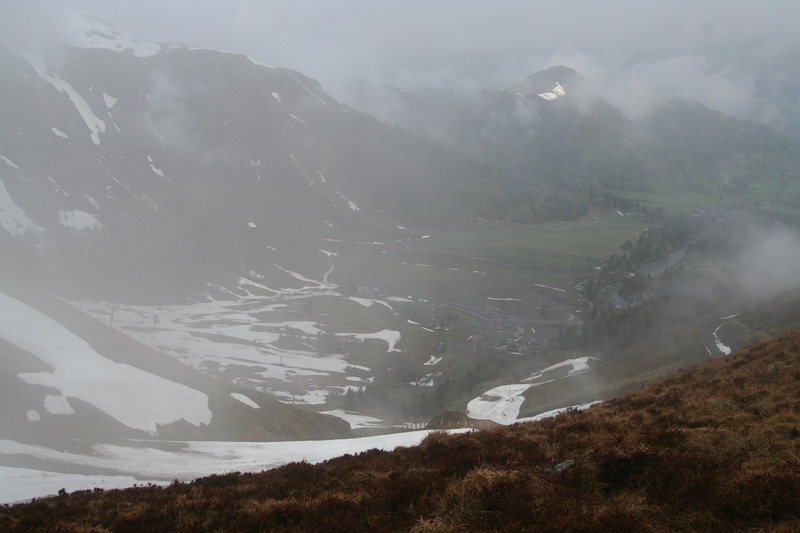 Patches of blue sky, but unfortunately, Puy de Sancy kept its local clouds preventing me from getting a picture. 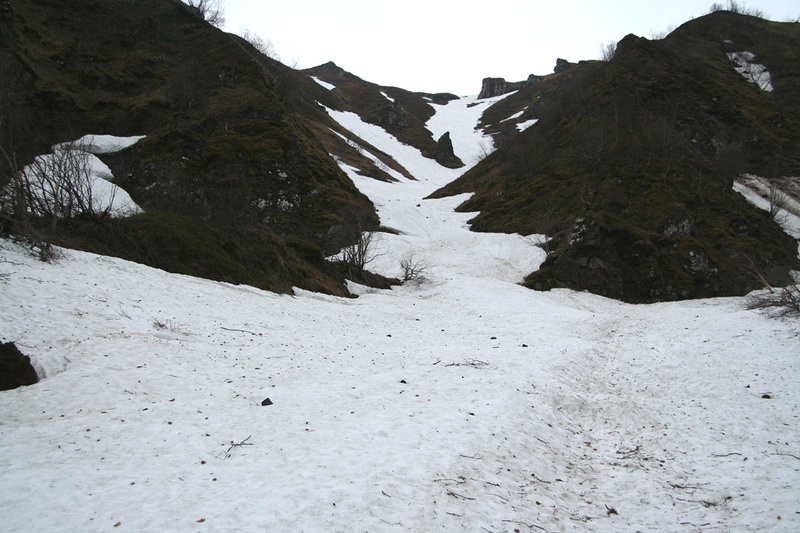 The route now has view down to the valley stretching north to the village Mont Dore on the left, now and then also to La Vallée de Chaudefour on the right side of the ridge. 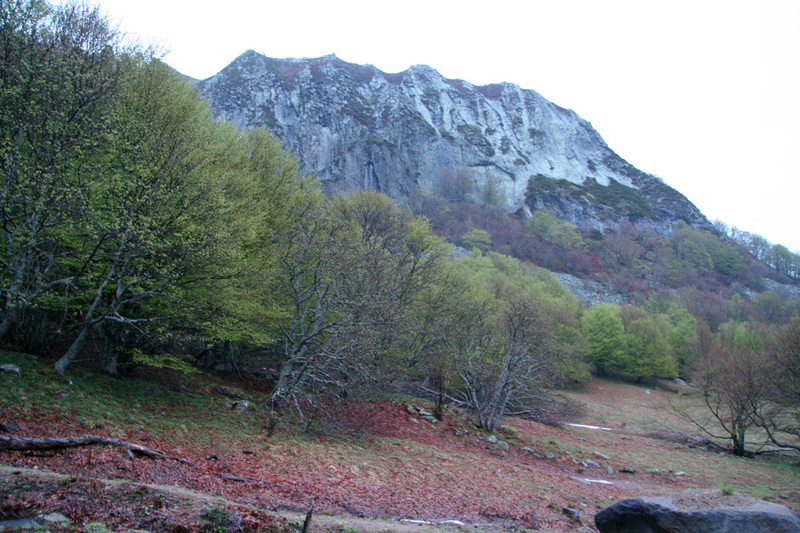 My route continued across several more tops until the trail fork at Puy de Crebasses (1762m). 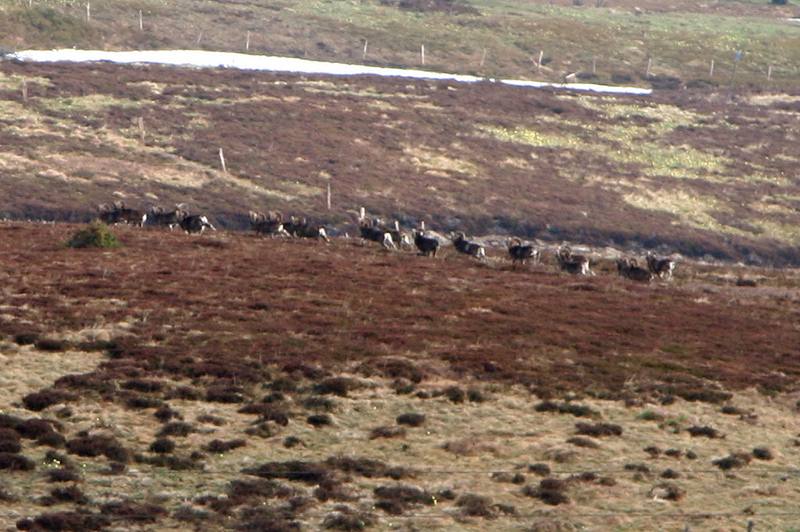 While following the ridge further down I suddenly scared a herd of wild mountain sheep. Unfortunately, they almost vanished before I had my camera ready. The weather was now much better and the view into La Vallée de Chaudefour with patches of fog and the impressive La Dent de la Rancune created facinating effects. Where the main trail turned away from the ridge, I located the smaller trail supposed to connect and provide access back down into the valley. Easier said than done, further down I completely lost the trail and decided to bushwalk straight down a small local ridge. Only moments later, a surprisingly nice trail crossed below me and it could now be easily followed back down to the main signpost on the valley floor. 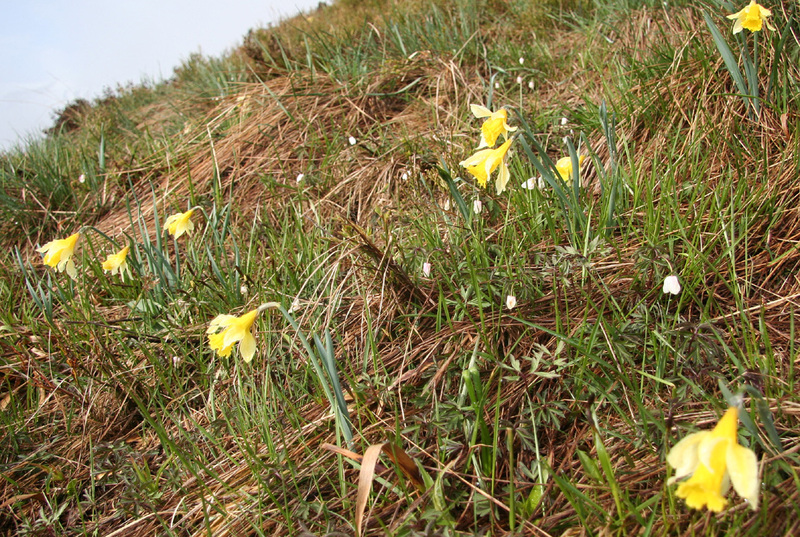 This side of the valley was free of snow and many spring flowers already decorated the slopes. Along the way, the view of the valley and of the rock formations "La crete de Coq" and "La Dent de la Rancune" is worth a few stops for picture taking. I was back at my car at 1030, a two hour descent hike that can strongly be recommended. The summit is marked at 1886 meter, however the recent 1:25.000 scale map as well as my GPS agreed on 1885. Topping out of the snow gully. The view from the top of the snow gully. Puy de Sancy is hidden behind. The mountain right of center is Puy de Cacadogne (1785m) on the north rim. 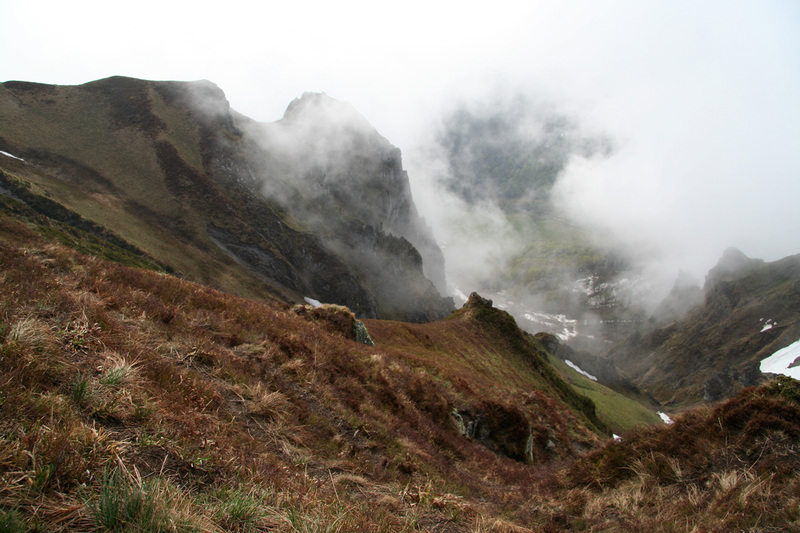 The summit of Puy de Sancy. Part of the route as seen from the north rim of the valley. Puy de Redon, 1781 m, as seen from Puy de Crebasses, 1762 m. Puy de Cacadogne (1785m), in the foreground. 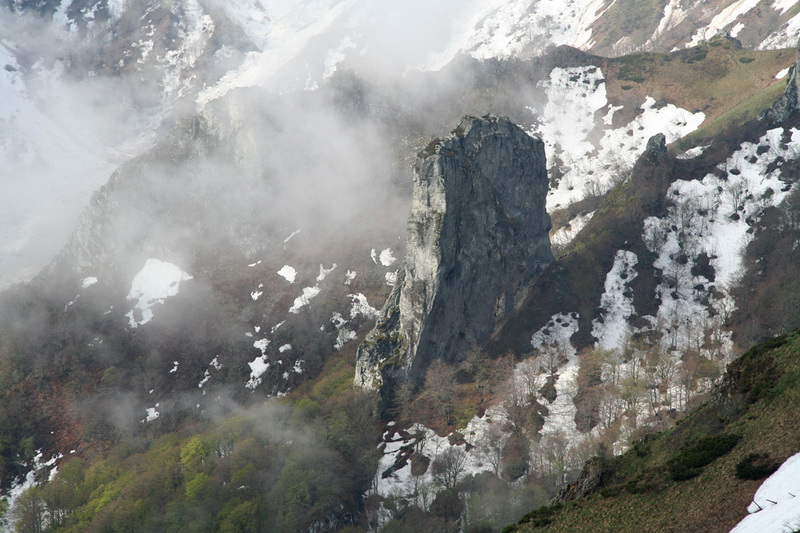 La Dent de la Rancune, an impressive rock in Vallée de Chaudefour. A nice bridge, 2.5 km long on A75 on my way to Barcelona from Puy de Sancy.